Now that the weather is getting a bit tricky outside it’s time to start thinking about taking activities inside. One way to do this is by adding a Gardening room to your basement. It can be an inexpensive way to extend your love of gardening to a year-round activity even in the wild and unpredictable Chicago climate!All you need at minimum is about an 8 by 8 foot wide space. First thing we do is lay an easy to clean tile floor, preferably with a drain, but it is but necessary. Next up is countertops with under cabinets for good storage. A nice deep sink, hopefully under a window for nice natural light. Then we will need upper cabinets for additional storage and lastly shelving and grow lights. Be sure to make the shelves adjustable to account for the differing heights of the plants as they grow. 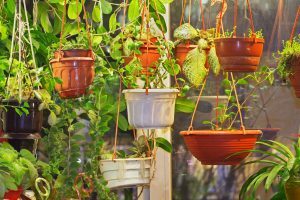 Be sure to also leave enough room for the grow lights not to burn the tops of your delicate plants. One more important thing to keep in mind is to be sure that your wall surfaces are water resistant. Now that could mean pre-treating your dry wall and then using water resistant paint or lining your walls with plastic sheets, or using exterior walls for your shelving walls and using a rubber-based paint on the walls or some other option; but the main objective is to avoid mold and mildew. We have now successfully created a beautiful space that the avid gardener can grow plants, herbs and vegetables year-round. This space also allows the gardener to get a jump on seedlings for the outside garden in spring. There is really no down side to the addition of this affordable room if you can find the space in your basement. For a basic sink, cabinets and countertop in a room that’s about 8 x 8 feet wide, a ballpark estimate could be $1,800 to $2,500 for the project. Of course, higher-end materials will drive up that price. Be sure you or your contractor uses mold and mildew resistant paints and materials or your dream gardening room will quickly torn into a nightmare! As an added bonus, a room like this can add a unique selling point to your home, if you choose to put your house on the market.